The loss of the Space Shuttle Columbia and the crew of STS-107, like tragedies before it, has spurred the creation of artistic commemorations and reimaginings of all varieties. Here we feature some of the works that have touched us. “16 Minutes from Home” was performed live at the 10th anniversary commemoration of the Columbia disaster at NASA’s Kennedy Space Center. The song’s title references the few minutes that stood between Columbia’s crew and a safe landing at Kennedy Space Center when their flight was permanently interrupted. 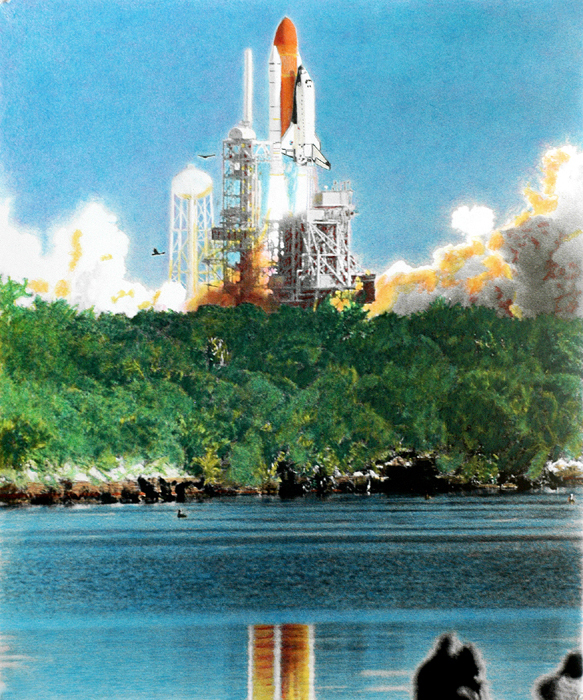 Space Coast photojournalist Lloyd Behrendt‘s painting “Sacriflight” is an oil painting based on a black and white photograph of Columbia’s doomed launch. He created it “to represent the accomplishments of the STS program and memorialize the precious sacrifices of those lost over the years we have explored the harsh and sometimes unforgiving environment of space.” The painting was featured on the cover of Space Safety Magazine’s tenth anniversary special report on the Columbia disaster. Have we missed your favorite Columbia song, performance, or piece of art? Drop us a line along with a brief review of the work, and we’ll take a look.